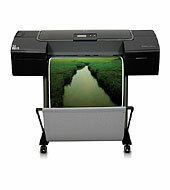 HP’s 8-ink Designjet makes it easy to produce vivid, high-impact, large-format color and b&w prints. 8 Original HP Photo Inks deliver durable prints in color and blackand-white lasting up to 200 years. Boost color accuracy—complete coverage of SWOP, ISO, GRACOL, DAP, EUROSCALE, TOYO, and FOGRA gamut. Don't buy HP DesignJet Z2100 Photo Printer Series without contacting Napco. Call us today at 1-866-752-6766.